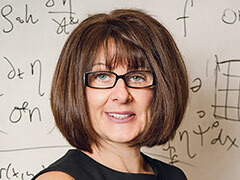 Suncica “Sunny” Canic, Cullen Distinguished Professor in the Department of Mathematics, will serve as a member of the NIH’s Modeling and Analysis of Biological Systems (MABS) Study Section, Center for Scientific Review. Her four-year term runs from July 2011 until June 2015. Study sections are critical to ensuring the quality of the NIH peer review process. The 13-member MABS Study Section reviews grant applications concerned with the development of modeling/enabling technologies for understanding the complexity of biological systems. The scope of these systems ranges from molecular, to supramolecular, to genes, to organelles, to cellular, to tissue and to organ level studies.